Knowing how to prepare for a natural disaster means knowing exactly what risks you face where you live and planning accordingly. 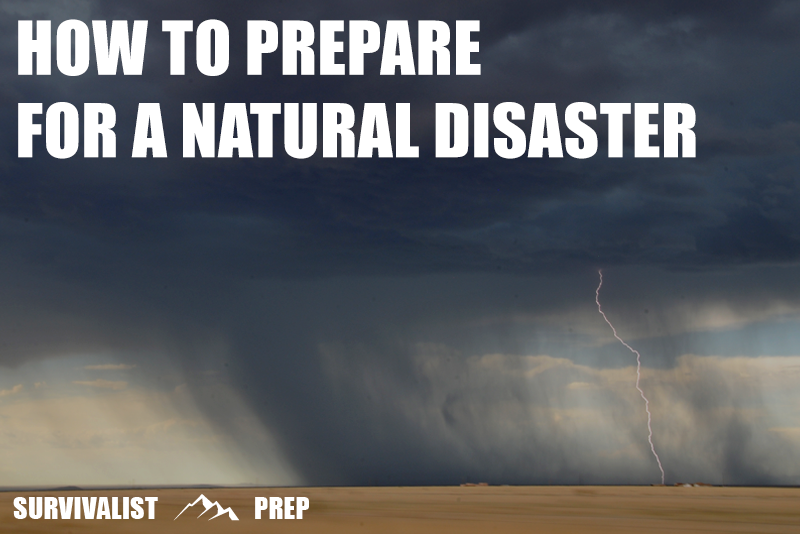 From major storms and tornadoes to wildfires and tsunami, our definitive guide on how to prepare for a natural disaster will walk you through everything from what to know and where to go, through to what to stock if staying and what to pack if you need to evacuate. Whether we’re talking about the increasing frequency of major weather and climate-related events, disasters originating beneath the earth’s surface, or those coming from space (think asteroids and solar flares), the range of serious natural events that have the capacity to wreak havoc is breathtaking. While we may not be able to prevent natural disasters from happening, it is possible to increase your readiness, adopt a strategy and make a plan to ensure that you minimize the adverse effects on you and your family if such a situation begins to unfold. The purpose of this guide is to walk you through the essentials of how to prepare for a natural disaster, from the types of event and the risk factors involved, through to what you need to do to plan ahead and mitigate accordingly. By arming yourself with the most relevant information, you’ll be able to rest easier knowing that if mother nature decides it’s time to do things her way, you’ll be fully prepared. The term ‘natural disaster’ is a broad one, covering a whole variety of disruptive, destructive, and deadly events originating either here on earth or from beyond our atmosphere. Natural disasters can wreak havoc in any number of ways with the major threat from some coming in the form of extremes of temperature and others through the sheer destructive force of water, wind or electricity. With that being said, one thing is a common factor of every natural disaster – none of them are man-made. While failures of man-made infrastructure (such as dams, levees, power-grids etc) can massively exacerbate the effects of a natural disaster when they strike, they’re not the actual cause of the actual event. This isn’t to say that there aren’t destructive natural forces that humans haven’t been involved in forming. For example, the possible human role in climate change can be viewed as a serious precursor to much of the erratic weather we see (and that is likely to increase in the coming years). For example, the possible human role in climate change can be viewed as a serious precursor to much of the erratic weather we increasingly see (and that is likely to increase in the coming years). Ultimately though, when we talk about how to prepare for a natural disaster, we’re thinking specifically about the direct effects of an act of nature and how to minimize exposure and the resultant damage caused by these events. When comparing the preparedness steps for a natural disaster as opposed to a man-made incident such as a nuclear attack or terrorist incident for example, there will always be crossover in terms of the steps you can take ahead of time, although it’s crucial to understand the specific differences and nuances between these very different emergency situations in order to prepare accordingly and react effectively. Whatever the emergency, whether we’re talking about a major hurricane event or a devastating earthquake, there are a set of general preparedness tips that will serve you equally well and should be developed as the foundation of your overall disaster resilience strategy. The best course of action before, during and after a natural disaster will ultimately inform how you’ll react in the moment. With that said, the goal of emergency preparedness is first and foremost to give yourself as many options as possible to react, respond and survive when the time comes. If you have advanced warning of an impending natural disaster, your best course of action may be to evacuate your home and get to a pre-determined bug out location or designated safety zone. In this case, knowing how to lock your home down and having a comprehensive bug out vehicle strategy prepared ahead of time are absolutely essential elements of your strategy. Thinking about how to prepare for a natural disaster such as a severe winter storm or solar flare (natural EMP-like event) may see you hunkering down in your home. In this instance, knowing how to ‘bug-in’ and getting your home ready for a potentially prolonged period of lockdown is incredibly important. This will cover everything from preparing an emergency survival pantry and building your preparedness stockpile through to planting a survival garden that you can draw on to remove your reliance on the food logistics system if the stores are closed and the refrigerator doesn’t work. What happens if you bug out by vehicle or choose to stay put in your home but then find yourself needing to quickly evacuate on foot? This is a scenario all too often overlooked by people until it’s too late to do anything about it, but whether we’re talking about a vehicle breaking down en-route to an evacuation point, or a home emergency such as a fire forcing you and your family out of your home, you have to be prepared for the possibility. Without a shadow of a doubt, the best thing you can do to prepare for this kind of eventuality is to assemble a bug out bag with at least 72 hours (three days) worth of supplies and equipment. Without a shadow of a doubt, the best thing you can do to prepare for this kind of eventuality is to assemble a bug out bag with at least 72 hours (three days) worth of supplies and equipment that means you can grab and go should you need to bail out at a moment’s notice. Similarly, ensuring that you know how to react in a diverse range of adverse conditions and environments from wilderness survival through to an urban setting will mean that whether you find yourself in the middle of the city or in the middle of nowhere, you’ll know how to react quickly and effectively. If you’re totally new to emergency preparedness or are a seasoned veteran when it comes to disaster planning, one of the best things you can do right off the bat to prepare for a natural disaster is to make sure that you have the above points covered. This will mean that you have the major bases covered whether staying home or evacuating. From this foundation, you’ll be able to build a second, targeted level of resilience planning and strategy around specific disasters based upon your geographical risk factors. Natural disasters are often devastating when they occur and can be unpredictable both in terms of forecasting and when trying to anticipate how they’ll unfold. This guide is broken down into sections covering the major natural disasters in detail and in each case covering what you need to know, the specific risk factors and preparedness strategies to get you out the other side. Earthquakes occur as a result of movements in the Earth’s crust and can vary in intensity from minor tremors to city-leveling destructive force. Prior to these movements, the stored energy is built up, and like a spring or rubber band is just waiting to be released. When this occurs, the resulting energy is felt in the form of a quake potentially ranging from a minor tremor to a highly destructive event. If you live in an area that’s prone to seismic activity, secure all unstable or free standing items such as loose shelves etc to secure anchor points such as the wall as these will almost certainly be the first things to go in the event of an earthquake. Similarly, move any heavy, delicate or valuable items off of high areas to minimize damage to them (and to you) if a quake occurs suddenly. Remembering that an earthquake can strike without warning, you want to pay particular attention to any heavy or hazardous items located above areas where you sleep or sit – shelves directly above a bed or couch are a definite risk here and should be avoided. As with other natural and man-made emergency situations, the more you’ll be able to prepare yourself ahead of time, the more resilient you’ll be if disaster strikes. With this in mind, you should look to stock your home emergency preparedness stockpile and also consider putting together a dedicated earthquake kit which you can quickly and easily grab if the ground starts to shake. The majority of injuries during an earthquake are caused by falling objects, so if you find yourself in the middle of a seismic event, get under a sturdy desk, table or similar as soon as possible. Once you’re in a safe place, hold on and wait for the situation to pass.and if your shelter isn’t ideal or you’re exposed when a quake strikes, drop to the ground, cover your head and neck with your arms and when it’s safe to do so, crawl to a more sheltered location. As soon as it’s safe to leave cover, get to your gas and power and turn both off. If the magnitude of an earthquake is above 5, it’s a good idea to also turn off your water until the hazard has fully passed. Areas with previous seismic activity and those designated as ‘seismic zones‘ are most at risk of suffering a major earthquake although, in the US, all 50 states are ultimately at a risk of some degree of earthquake event or tremor. Areas with the highest risk include those around the San Andreas Fault in California, the New Madrid Fault Zone (southern and midwestern states) and the Cascadia Subduction Zone in parts of Oregon Washington, Alaska and Western Canada. The frequency or probability of earthquakes can’t be pinned to a specific time of year and they can occur suddenly and without warning, however, it’s important to remember that even once the initial quake has passed, aftershocks can follow anywhere from minutes to weeks following the initial event. Depending on the epicenter of the activity, an earthquake’s effects can have a focal point out at sea, and when this happens, the resultant wall of water which spreads outwards can be both unstoppable and highly destructive on it’s way towards land (see Tsunami below for more details). If you live in an area that’s borne witness to a hurricane in the past, then knowing how to prepare for a natural disaster absolutely means knowing how to prepare against the effects of these deadly storm systems ahead of time and when they arrive. Hurricanes form over water before coming ashore and causing damage and destruction through a combination of high winds, torrential rainfall, coastal storm surges and potentially serious flooding. The massive storm systems that develop out at sea and then make landfall are known as hurricanes when they originate from the Atlantic or Gulf of Mexico and typhoons or cyclones when they strike from the Pacific or Indian oceans. One of the major causes of death from hurricanes often comes in the form of severe coastal and inland flooding following heavy rainfall and storm surges. Where these events overpower the infrastructure or flood defenses of an area, the rising water level which results can be deadly. The approach of a hurricane is often known in advance and when this is the case, evacuation is often the best strategy – and can be mandatory. In these cases, find out the evacuation routes where you live, leave with plenty of time to spare ahead of the storm’s arrival and have a strategy in place for where you’re going to stay – relatives/friends, bug out location etc. Preparing a dedicated bug out bag or go bag ahead of time is absolutely essential in a scenario where you have to evacuate your home, providing you with everything you need to survive for up to 72 hours (3 days) in a single bag that can be grabbed as soon as you need to leave. If you decide not to evacuate your home, you’ll need to prepare for a potentially prolonged period without access to utilities (such as power, water, and gas) as well as not being able to reach stores for food, water or supplies for potentially many days. The following tips will help you get your home in the best shape possible ahead of an approaching hurricane or tropical storm. Flooding can strike suddenly and a rapid rise in water levels can be disastrous to property. If you live in an area that may be susceptible to flooding in the event of a storm (even if it hasn’t historically flooded), consider taking out flood insurance on your home. Clear all clogged drains, pipes, and gutters on your property and make sure that all loose rain downspouts are secured. Prepare for hurricane force winds by trimming any damaged trees or branches in the vicinity of your property. In the event that the power gets knocked out, having access to a portable generator will ensure you can keep the lights on once the storm has passed and until power returns. One of the most important things to do in the event of an approaching storm is to monitor the forecast continually. If a major storm is forecast, either a hurricane watch (major storm conditions possible within 48 hours) or hurricane warning (hurricane conditions expected within 36 hours) will likely be issued. Assess your proximity to the approaching storm based on the forecast and the Risk Factors outlined below. Ensure that you have adequate supplies in both your household emergency preparedness kit and in your bug out bag. Let friends and family know of your plans ahead of time, whether you’re evacuating or riding out the storm at home. Do this via multiple methods (SMS, email, social media etc) to ensure the update gets through to the recipient. If you live in a vulnerable coastal area or on an island, you’re almost certainly at risk of experiencing a major storm system or hurricane at some time. While coastal areas will typically bear the initial brunt of a major tropical storm when it reaches land, the major damage is usually caused further inland as the system progresses, bringing high winds, torrential rain, and subsequent major flooding. The effects of a rise in sea level caused by a tsunami can be overpowering when they reach coastal areas following a seismic event and therefore being prepared for this kind of natural disaster is crucial if you live in a vulnerable area at risk from this kind of event. Tsunami is the term given to the series of waves (there are often more than one) that follow an underwater disturbance such as an earthquake, landslide or major underwater volcanic eruption. The wall of water that tends to characterize a tsunami is often responsible for drowning and severe flooding when it reaches land and can cause a number of other longer term effects to local areas including contaminated drinking water, loss of utilities and ironically, fires from ruptured fuel lines. Before a tsunami occurs, formulate an action plan and evacuation strategy that every member of the household learns and establish a communication and rendezvous plan for everyone if a tsunami strikes when away from home. As with other preparedness planning, practicing ahead of time means you won’t have to ‘remember’ what to do in the event of an actual emergency. If you live near the ocean or other at-risk areas (see below), be sure to keep a radio on during and after an earthquake or tremor, tune in immediately to get the latest information on the event. In the event that an earthquake strikes or a tsunami alert is issued, head inland and get to higher ground as safely and quickly as possible. Should you find yourself near the ocean when a tsunami event is imminent, one visible sign to look out for is the water suddenly receding from the shore. If you see this, get out of the area and get as high as possible immediately. The biggest risk from tsunami and major tidal wave activity comes to those who live near the ocean. With that being said, even those living further inland (particularly in low-lying land) could be at serious risk depending on the size of the wave that hits. Tsunami are almost always caused by a major seismic event such as an earthquake under the seabed and with this in mind, those living in coastal areas and in areas prone to seismic activity are most immediately at risk. Major hotspots include anywhere along the highly volatile Pacific-Rim such as Japan, New Zealand, Indonesia and the western coasts of Canada, the US and South American nations. Another high tsunami risk comes from the potential of an object from space such as an asteroid or comet striking one of the Earth’s oceans, causing a potentially catastrophic tidal wave in all directions from the point of impact (imagine throwing a large rock into a lake and the resulting waves outwards). In this instance, all coastal areas would be at potentially high risk, regardless of proximity to seismic hotspots. The majority of damage from these devastating columns of spinning air is usually inflicted in the direct path of the tornado or in the surrounding area and can range from crippling damage to homes and infrastructure through to a utility disruption. If formed as part of a major thunderstorm, severe hail, torrential rain, and resultant flooding can also occur during this kind of event. If you live in an area prone to tornado activity (see Risk Factors below) the priority thing to do is to identify a safe room or shelter that you can quickly get to in the event of a tornado warning. You should look to identify shelters in multiple locations including your home, work and places you or your family frequently go such as schools, public buildings, malls etc. If you’re not sure whether a building in your area has a dedicated or suitable area, ask the building manager or at a public building such as town/city hall, public library or school. It may not be possible to get to an underground shelter or designated area and if this is the case, get to an interior room with no windows (such as a closet or bathroom). Once you find shelter, duck and cover immediately and if not in an ideal or dedicated shelter, protect your head and neck with either a cushion (or similar items) or with your arms. Serious tornadoes occur more frequently in the US than anywhere else and certain areas such as the Mid-West region and as well as the plains, Gulf Coast and Florida all at a high risk. In terms of when you’re most likely to face a tornado, they can ultimately form at any time of the year, although spring and summer are often considered ‘prime season’ for the perfect storm. Similarly, tornadoes can strike at any time of the day but most commonly occur between 3 and 9 pm. Severe winter weather can come on suddenly and severely, and when it does, it’s imperative that you’re prepared for every potential eventuality. Winter storms form when the temperature falls low enough to cause any precipitation in the air to fall as sleet or snow. When this combination occurs, the colder the temperature and higher the precipitation, the worse the storm. While the most obvious effect of winter storms comes in the form of plummeting temperatures, other related events such as downed power lines can cause long-term blackouts while extreme temperatures, snow and ice may close off access routes as well as shutting down logistics to grocery stores and other essential services. Blizzards and snow storms can ultimately affect almost anywhere and some believe they may be exacerbated by a changing climate. With that said, northern latitudes, as well as areas at higher altitudes and mountainous regions, are typically most at risk from these events on a regular seasonal basis each year. In terms of when you’re most likely to be at risk of a severe winter storm, as the name suggests, the worst weather can often be expected between November and February, although early fall and spring should also be included in the preparedness range for cold weather events. Wildfires (also known as wildland fires) are unplanned fires which occur within forested, woodland, and grassland areas. When they strike, wildfires can be devastating and spread at an incredible speed, often not leaving much in the way of a window for escape once fully underway. From the destruction of property and infrastructure, through to serious injury and death of people and animals, the serious hazards posed by a wildfire should never be overlooked. The greatest risks from a severe wildfire come from a combination of factors including the fire itself (and the embers which may travel anywhere up to a mile away from the location of the fire), through to hazards related to smoke and even the longer term effects of damaged infrastructure once the fire has cleared. As with most natural disasters, wildfires can ultimately occur at any time of the year, however particularly dry conditions or periods with little to no rainfall can present the perfect situation for the outbreak of a severe fire, with dry brush, trees, and grass much more susceptible to ignition and catching alight. Similarly, when these conditions are paired with high winds, the spread of a devastating wildfire can be exacerbated. If there is knowledge of an impending natural disaster around the corner or if an emergency situation has already unfolded and your home no longer remains a safe refuge from risks and hazards, being able to quickly and effectively get out and to a location of safety may become a priority. For some scenarios such as approaching hurricanes or severe tropical storms, mandatory evacuation orders may force your hand and mean the decision is removed from your hands entirely. Similarly, you may decide that the safest bet for you and your family is just to get out of dodge as quickly as possible (and before others get the same idea). Either way, the upshot is the same, preparing for this eventuality ahead of time can represent the difference between a quick and easy getaway and a highly unfavorable alternative. It should therefore be a priority in any natural disaster preparedness planning – whether we’re talking about tornadoes or wildfires, blizzards or earthquakes – to put together a series of comprehensive bug out and evacuation strategies which mean if you have to go at a moment’s notice, you’ll simply be able to grab your gear and get out of there. If you need to leave fast, the initial priorities are ensuring the initial safety of you and your family and making sure you have the essentials for continuity and survival to last you (and all the members of your party) for a minimum of three days. General best practice here is to start by preparing a bug out bag with provision for 72 hours of survival as a baseline of your evacuation strategy and working up from here. In a natural disaster situation, you may find yourself having to leave extremely quickly without a moment’s hesitation and in this case, your bag needs to be ready to go, in a convenient location and easy to carry. The particularly adverse conditions of some natural disasters will also put an extra level of strain on the performance of your bag, with factors such as heat, cold, water and dust all potentially playing a major role in your ease of escape. One of the most important things to consider when it comes to evacuating by vehicle during a natural disaster is when you’ll actually be on the road in relation to conditions seriously deteriorating. This matters for two crucial reasons. Firstly, almost any major natural disaster will likely have a detrimental, if not crippling effect on roads and transport infrastructure. The effects of this can range from severe flooding, smoke or blizzards making roads impassable through to hurricane force storm conditions turning the route out of town into an area of deadly hazards. The effects of this can range from severe flooding, smoke or blizzards making roads impassable through to hurricane force storm conditions turning the route out of town into an area of deadly hazards. Secondly, your ability to successfully evacuate the area by road will be determined by how far in advance you’re able to get ahead of the crowd. In a survival situation, hesitation is rarely an ally and indecision when it comes to hitting the road earlier rather than later can prove disastrous. In a survival situation, hesitation is rarely an ally and indecision when it comes to hitting the road earlier rather than later can prove disastrous. With enough planning ahead of time however, getting out of town by vehicle represents one of the very best means of evacuating the worst effects of an approaching natural disaster, allowing you to both carry more equipment, while also putting maximum distance (in minimal time) between you and the danger. Preparing a bug out vehicle strategy will allow you to ensure that your vehicle is not only maintained and in top condition if you need to call on it in an emergency situation but will allow you to carry considerably more supplies on top of your bug out bag loadout. While effectively increasing your load out of equipment and kit for considerably longer than three days, preparing and packing a vehicle for use in a natural disaster means you can also carry heavier and bulkier pieces of gear such as a high-performance survival tent or more comprehensive emergency meal solutions. With these considerations in mind, this guide looks to provide advice on our own personal considerations when planning for a natural disaster, however, it’s always important to carry out your own due diligence to find the best solution for you when preparing for the unforeseen. As with all of our preparedness guides, we reference as many expert sources, real world user reviews, and opinions as possible so we’re able to provide the most relevant and educational information on how to prepare for a natural disaster. Knowing how to prepare for a natural disaster is ultimately a highly personal activity with individual needs and preferences sometimes varying considerably between people, locations, and specific situations. With these considerations in mind, this guide looks to provide advice on our own opinions of how to prepare for a natural disaster, however, it’s always important to carry out your own due diligence to find the best solution for you when developing a strategy, plan, and solution that’s perfect for your situation.